Learn what we do and how we help manufacturers to succeed. Are you thinking about hiring your first employee? Have you hired some employees but not sure you've done everything correctly? This workshop will give you everything you need to know about hiring employees and complying with all the applicable laws and regulations. Gain a greater understanding of how to choose, work with, and source fabric for your designs. If you're planning to produce apparel or sewn products, this session is for you! SFMade members interested in selling food and beverage products should contat Christine here. SFMade members interested in selling consumer goods should contact Julie here. Hey SFMade members, it's easy to rep the SFMade brand! Check out our handy guide, which includes an order form for free SFMade stickers, table tents, and other collateral. Due to popular demand, SFMade has launched the SFMade Consumer Products Guide, a new tool to help retailers, organizations, and corporations source and purchase SFMade consumer products. SFMade members are encouraged to learn more and apply here. SFMade members can post a job on SFMade's Job Board, and we'll help you screen for qualified candidates too! Email job descriptions to [email protected]. We're proud to announce the launch of our first internship program, YouthMade! SFMade has partnered with JUMA Ventures to build an innovative new program that places college-bound youth from low-income neighborhoods into paid internships with San Francisco manufacturers. Last Monday ten youth started their six week internships with SFMade member companies, including Anchor Brewing, McRoskey Mattresses, Timbuk2, and seven others. 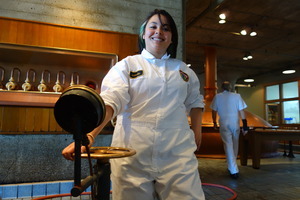 Pictured above is Sandi at Anchor Brewing who's learning the ropes of each production station (and said she'll never think of beer the same after this). 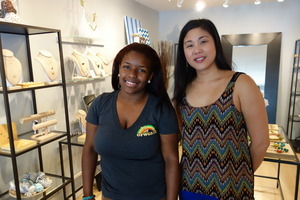 Pictured below is Liza, owner of Ofina Jewelry and Azil boutique, with her intern Tanaya who is headed to Texas Southern University in the fall. 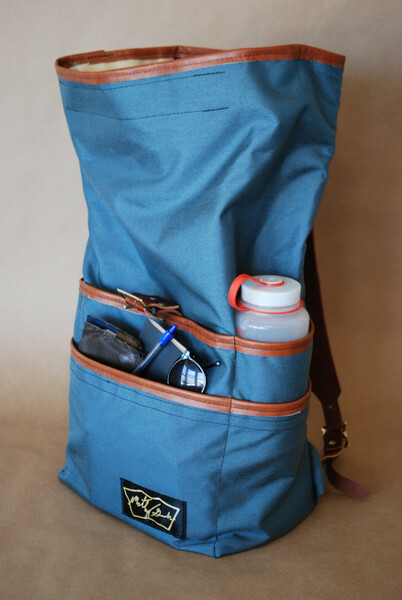 Product We Love: Summertime is here so grab your backpack and hit the trails/beach/country… What's that, you say? You don't have a backpack!? The Weekender's cool colors and leather trim caught our eye, plus it's refined enough to take to work, yet large enough to take you out of town. I want one! Get it here. Ambrose Ku has been running his family business off and on for twenty years. West Coast Garment Manufacturing does contract cut and sew work for several well-known brands, including a handful of SFMade companies. The company is one of the sector's largest contract manufacturers, employing 30-40 people depending on the season. There have been some up and downs- the factory moved to the Bayview last year after rent downtown got too expensive- but Ku is looking towards the future. "Things have changed a lot in the last few years, and because contracts with larger companies can be inconsistent, we want to focus on some new strategies," he said. Ku is looking for a local designer to partner with to co-create a line that can be sold online. Last month SFMade held a factory tour of the facility and Ku met with some designers. "We're looking to find a whole new market with this project," he said. West Coast Garment Manufacturing is located at 70 Elmira St in the Bayview. Phone: (415) 896-2177. SFMade's mission is to build and support a vibrant manufacturing sector in San Francisco, that sustains companies producing locally-made products, encourages entrepreneurship and innovation, and creates employment opportunities for a diverse local workforce. SFMade is a 501 (c)(3) non-profit corporation.